CONCLUSION Let the exploitation begin . . . IN TIMES OF GLOBAL financial crisis and increasing media clutter, methodical tools matter more than ever before. A Culture of Revolution breaks down structure and liberates your orga- nization's ability to adapt. Within your organization, intentionally destroy in order to create, encourage failure, obsess about your customer, and un- derstand specifically what it is that you are trying to do. 260 Trend Hunting fuels your creativity and helps you to identify the oppor- tunity that lurks within the noise. Reset your expectations, open your eyes to the fringe, and develop a toolkit to filter your ideas. Adaptive Innovation increases your likelihood of success, especially in areas of uncertainty. Be methodical and manage your innovation like a stock portfolio. 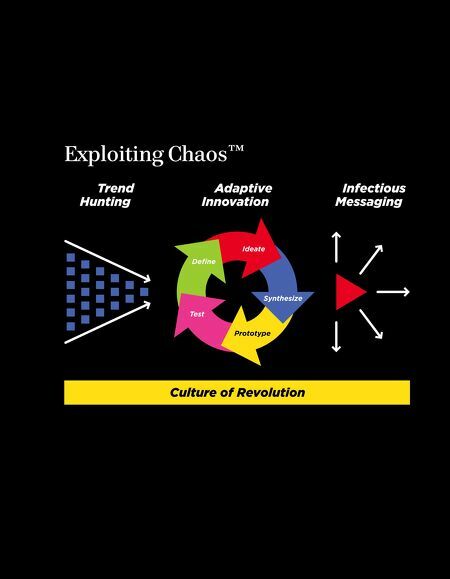 Infectious Messaging enables your ideas to break through all the clut- ter. Above all, never forget Rule #1: Relentlessly. Obsess. About. Your. Story. 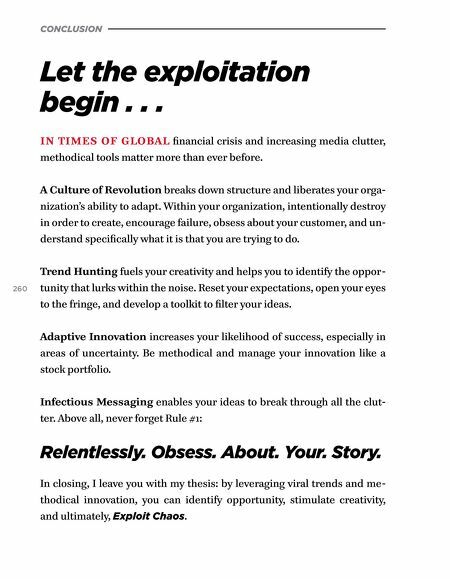 In closing, I leave you with my thesis: by leveraging viral trends and me- thodical innovation, you can identify opportunity, stimulate creativity, and ultimately, Exploit Chaos.